The Dell Security Peak Performance event last October in Orlando was an incredible event. “Wow, excellent experience at Dell Peak Performance 2014! Learned so much. Lots of great ideas for new business! Lots of great partners eager to help,” one of last year’s attendees said. If you were unable to attend in-person, but curious about what all of the buzz has been about lately I encourage you to attend our upcoming Dell Security Virtual Peak Performance 2015 event for our partners on Wednesday, Feb. 25, 2015. This year will be unforgettable at Dell Security, and we’d be ecstatic for you to be a part the success. Dell channel partners attending Dell Security Virtual Peak Performance 2015, Feb. 25, from 8 a.m. to 1 p.m. PT will gain valuable insights to help them reach new heights with our award-winning Dell SuperMassive next-gen firewalls, Dell Secure Mobile Access and Dell Email Security solutions. We have twice as many resources dedicated to the channel and 100 percent focused on what is core for your business to grow. Dell SonicWALL Email Security on-premise and cloud – What’s next? What’s New in Secure Wireless? 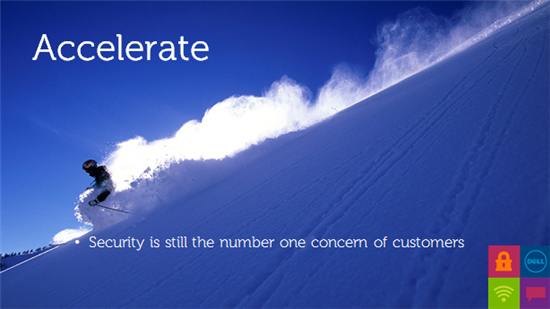 How is Dell SonicWALL Addressing BYOD and Securing Mobile Access? 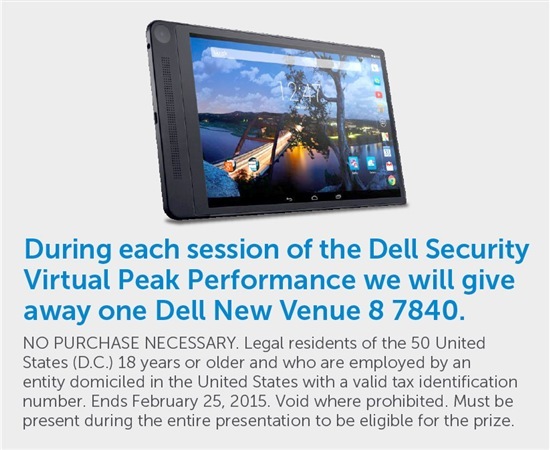 Dell partners will have the chance to win a Dell Venue 8- 7000 Series tablet after each presentation. Don’t miss your opportunity to win. Stay tuned and join the conversation in real time via Twitter using #DellPeak and follow @DellSecurity and @DellChannel for the latest updates live online for this virtual event. If you can’t wait until the next week, you can demo our security products online by visiting our Live Demo site. I am so looking forward to hearing from you next week.